I’m back in London and on fire to honor another gorgeous gourmet gal for Woman Crush Wednesday. After a break last week (though I did a comprehensive round up of the amazing chefs honored so far, which you can read here) I am ready to bust out some bad singing and dancing. Of course only to compliment the awesome recipe on the docket. Today’s honoree is the talented chef, blogger and now a first time published cookery book writer Ayesha Curry. 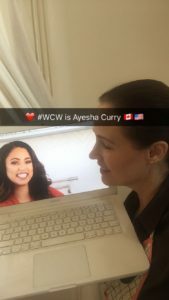 Ayesha is a dual citizen like myself, though she is an American/Canadian citizen. 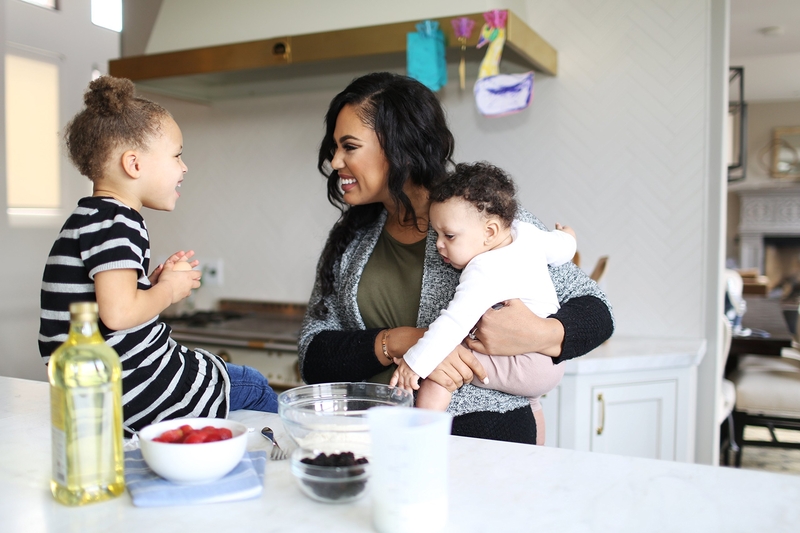 She lives in San Francisco with her husband (basketball player Stephen Curry) and their two beautiful little girls Riley and Ryan. She grew up with a mom who loved to cook and those culinary skills obviously rubbed off. 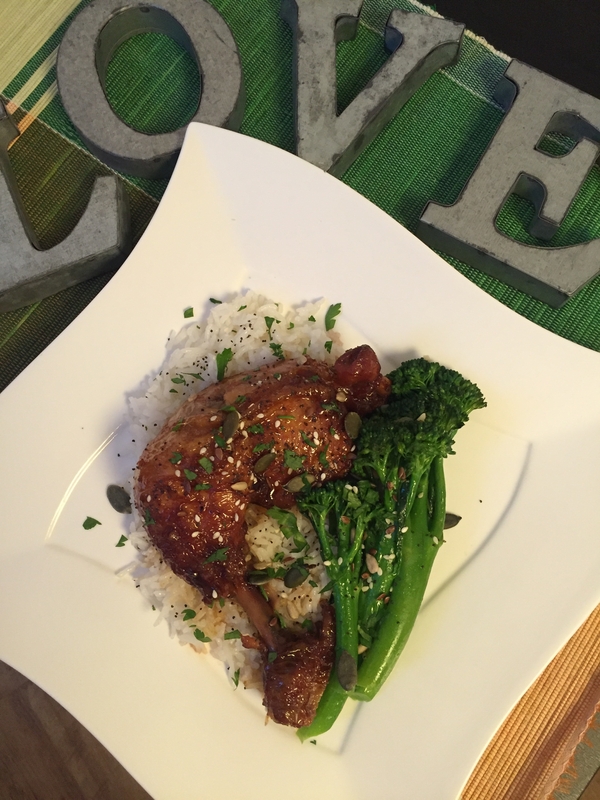 Especially this recipe for Roasted Brown Sugar Chicken which I will re-create live on Snapchat . As usual, this is a recipe I have never made before. 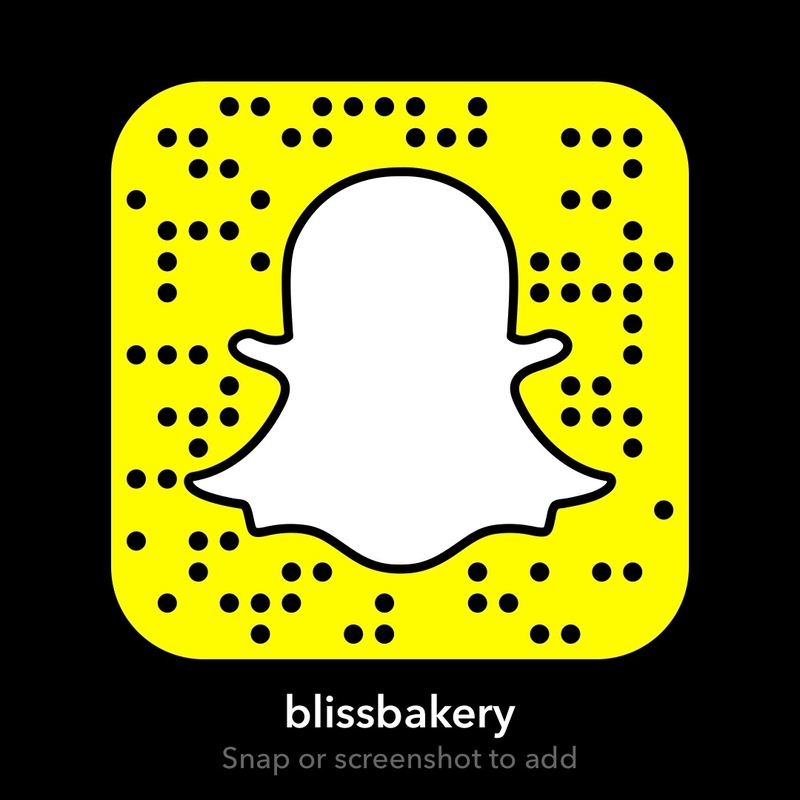 So you will see every step if you watch (my username is blissbakery) and I’ll post the photos below. So let’s get cooking! Preheat oven to 350F/180c degrees. Heat a dutch pot on med high to high heat with your butter and olive oil. Generously salt and pepper your chicken quarters. Brown the skin of your chicken in the pot for about 2 mins on each side until it’s crisp and golden brown. Remove the chicken quarters and reduce the heat to medium. Add in the shallots and garlic. Deglaze the pot with the chicken stock. Scrape down all of the sides to make sure you get all of the delicious seasonings and flavors into the broth (I’m hungry already!). Add in the soy sauce, brown sugar and ginger. Simmer the sauce for about 5-10 mins. Add the chicken quarters back into the pot, place the lid on and bake for 45min to an hour. 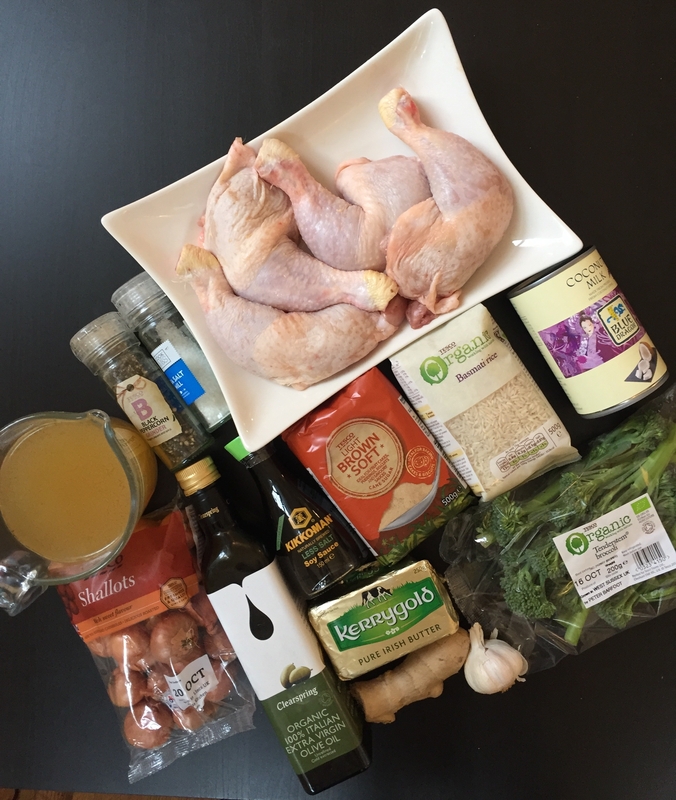 The chicken will be flavorful and falling off the bone. Mmm mmm mmmm! Okay, for real, you have to make this recipe. It was so delicious and mouth watering. Literally the chicken fell off the bone it was so tender and just melts in your mouth! Hubby ate his and started in on mine too when I left the table for a moment. And the rice cooked in coconut milk was the perfect side dish. 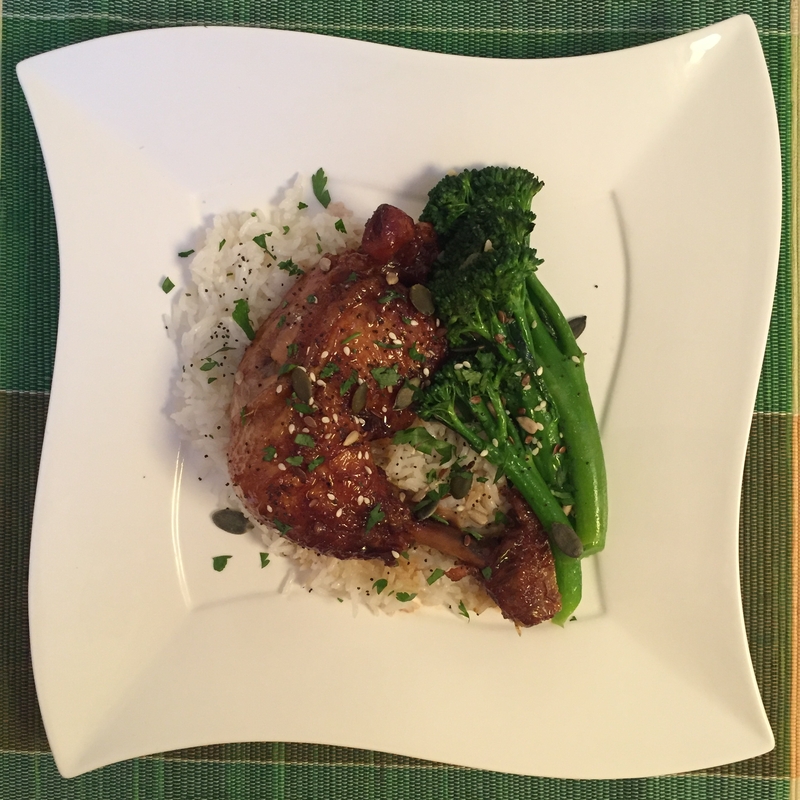 Even the broccolini was nice and sharp, crisp and a healthy green side. I’d make this whole dinner again in a heart beat! LOVE! 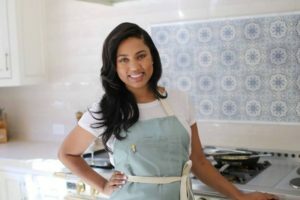 Speaking of hearts, Ayesha is such a giving and kind hearted person. Even though busy with her cooking career and family (she was an actress and model before she had children) she makes time for philanthropic endeavors. Such as her wonderful Little Lights of Mine in which she donates to the to No Kid Hungry campaign to feed hungry children for every bottle of her olive oil that is sold. It is refreshing that she is open about her Christian faith. So many celebrities feel the need to hide their religious beliefs for fear of alienating any of their followers. But Ayesha and her husband actually met as teenagers at their church. This foundation has kept their relationship rooted and grounded and they are delighted to share that with the world. I so loved doing a #WCW for Ayesha. I hope she enjoys it as much as Hubby and I enjoyed her delish chicken. And with two girls of her own ( I have one daughter and two granddaughters) having some #girlpower is a good thing!